At Garrity Chiropractic, our goal is to get our patients pain-free by offering short term relief care in a nurturing and supportive environment. Our patients consist of infants and children, seniors, athletes, and individuals who know that chiropractic care can enrich their quality of life. Dr. Gregory Garrity and his staff are always available for questions and concerns. Our hope is to not only relieve your pain, but provide education on how you can maintain a healthy lifestyle and avoid future problems. Thanks for visiting our site. We look forward to meeting you and learning how we may be of service to you. Please give our Danvers office a call today at (978) 774-5475 to schedule your appointment. Office staff is very friendly and efficient. Dr. Garrity is professional and has a great bedside manner! I wouldn’t go anywhere else for treatments. Fantastic experience. Very helpful. I highly recommend Dr. Garrity! Love Dr. Garrity, very friendly and professional. Staff is great as well. The location is close to my home and there is always available parking. I recommend him to all my friends. My experience is always pleasant and professional. Saturday hours are fantastic. 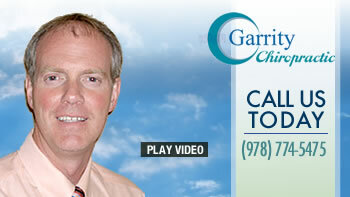 Dr. Garrity is knowledgeable, personable and efficient. Best chiropractor I’ve been to. It was a great experience and the visit was filled with educational opportunities along with personal help for my back issues. Everything about my first visit was so helpful and gave me hope that my pain can be reduced or eliminated. Thank you to all. Thank you Dr. Greg and your staff! For the professionalism and advice, I feel much better.